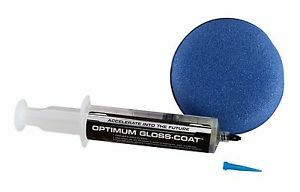 Optimum Gloss-Coat is a high-tech polymer system that forms an extra layer of clear coat over painted surfaces, wheels, plastic trim, bumpers, aluminum, and chrome just as the ceramic car coating. Formulated by award-winning Dr. David Ghodoussi, Optimum Gloss-Coat is mainly designed to provide unsurpassed resistance to etching caused by harsh detergents, and swirl marks that are often inflicted during the wash process. Car surfaces that are coated with Optimum Gloss-Coat will be protected for up to two years. Optimum Gloss-Coat is much like the clear car coating that already exists on the vehicle, except this, it forms a shell of protection that is glossier, slicker, and less prone to wash-induced swirl marks and marring. Optimum Gloss-Coat creates a self-cleaning finish that is considerably easier to clean and maintain compared to conventional waxes and sealants. Optimum Gloss-Coat can be applied to all exterior surfaces as part car detailing. It is not recommended for glass since improper application can affect the visibility adversely. For other exterior surfaces, Optimum Gloss-Coat is a highly effective car coat, transparent protective coating. It is the latest and updated, semi-permanent coating that offers the user an ultimate level of slickness and gloss from the car paint work with 2+years of durability. It can confidently be used on any part of the car for long term protection. It is resistant to any harsh chemical and detergents and even produces a coat which is less prone to scratches and swirl marks. It produces an ultimate hydrophobic finish for years similar to newly waxed car. The advanced formulation of this car coating even delivers highly anti-water spotting properties which is essential for long term coating maintenance just like car polish. For removing any defect, polish paint using Optimum polishes. For removing all the prior waxes, oils and silicones, clean the surface using 15% IPA solution. Further, prime the applicator by drawing X pattern across applicating pad. For each subsequent panel, the average requirement of is just few drops. At a time, wipe Optimum gloss coat over a single panel as a thin layer using two different directions that is in circular direction and front and back direction. Inspect the panel within 5 minutes with proper lighting searching for any thick areas which have not flashed away clearly. Then use the foam applicator or microfiber to remove any areas where you notice the streaks. This is very important step as any spot not properly levelled needs to be polished if permitted to cure. Avoid any unwanted wiping, touching or contacts for getting quality outcomes. For every panel, repeat the above-mentioned steps where you need application.